Believe it or not, radiant floor heating has been around for hundreds of years — in one form or another. It started out as a hot air heating system during the Roman Empire known as a “hypocaust.” This radiant heating system worked by heating the air in a cavity under the floor, which would in turn heat the room above. The heat was typically generated by a fire or furnace that needed to be manually fed with wood on a regular basis to maintain the heat. Today, there are two main types of radiant floor heat: Hydronic and electric. 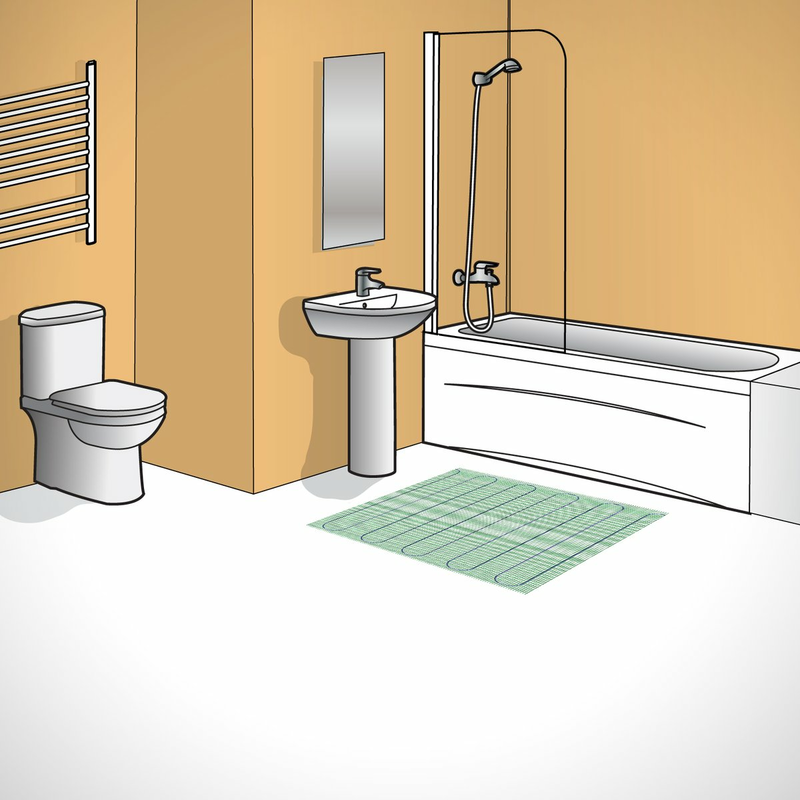 What is Hydronic Floor Heat? plastic tubing under the floor. Hydronic floor heat uses a boiler that pumps heated water through plastic tubing under the floors to deliver heat to the room above. For homes that don’t already have a boiler, this can be an expensive option because a boiler can cost around $4,000. However, it is relatively easy and inexpensive to integrate into homes that do have a boiler in place. Hydronic heating is ideal for new construction homes because it’s easiest to install before the drywall and floors have been put in. Along these lines, it’s not the best choice for remodeling projects because extensive construction can be required for installation. It’s also difficult to repair because it’s hard to locate the break when a leak happens. What is Electric Floor Heat? laid in a serpentine pattern under the floor. Electric floor heat consists of a heating cable laid in a serpentine pattern that radiates heat to the room above. The system can be controlled with a timer or thermostat, and — thanks to its quick heat-up time — it can follow a schedule to maximize energy efficiency and offer extra heat only when it’s needed. Unlike hydronic heating, electric floor heating is ideal for remodeling projects because the only thing you need access to is the subfloor. If the flooring in a room is already being replaced, it’s the perfect opportunity to install electric radiant heat because you can lay the new flooring material right on top. Plus, it doesn’t matter if you already have a primary heating system in place (such as forced air). Electric floor heat is a great supplementary or primary heat source for rooms that feel colder than the rest. Electric heated floors also have the unique ability to show where there’s a break in the cable, if an error were to occur. A professional can scan the floor with a thermographic camera to locate and fix the problem. This way, only a small portion of the floor needs to be removed to fix the issue. Without this perk, you’d be pulling up the flooring until you found the break, wasting lots of perfectly good flooring material. Finally, electric floor heat is affordable. 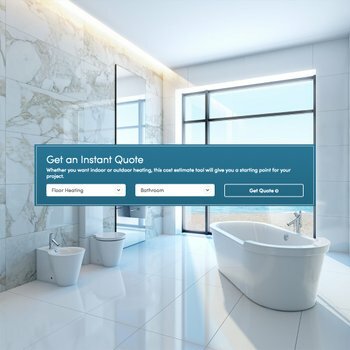 According to familyhandyman.com, adding electric radiant heat to a typical bathroom when you’re installing a new floor only adds about $200-$300 to the cost of the project. Plus, it only costs about $0.12 per kWh to operate, on average, which equates to pennies per day for a standard-size bathroom. Electric floor heating is available in different forms to suit the flooring being installed as well as the installer’s skill level. laminate and floating wood floors. In terms of flooring, WarmlyYours Radiant Heating offers three different types of electric heating systems designed specifically to handle various heat thresholds. TempZone™ is designed for tile, stone and hardwood floors. It produces 15 watts per square foot (depending on the spacing of the cable) to deliver even heat through these strong, solid flooring materials. Environ™ systems were made for carpet (in the U.S.), laminate and floating wood floors. These materials are known for having a heat limit, which, if surpassed, means they’d be more susceptible to damage. Environ™ heating systems were designed to work within this limit to produce safe, effective heat. They radiate 12 watts per square foot. Finally, Slab Heat systems were designed to be embedded within concrete. For this reason, they have the highest wattage per square foot at 20. This allows the heat from the cable to penetrate through the concrete to warm the room above. TempZone Easy Mats are ideal for spot heating. In terms of skill level, the floor-heating systems are available in different formats that suit the project as well as the installer’s level of expertise. For instance, TempZone™ systems are available in Flex Roll, Easy Mat and Cable options. Flex Rolls and Easy Mats feature the cable embedded in a serpentine pattern secured to mesh fabric. The cable is automatically spaced the recommended 3 inches apart, saving installers the trouble of most of the layout. Easy Mats are the easiest to install — hence their name — since they are designed for small spaces for spot heating. The mats come in pre-cut sizes so they only need to be rolled out and installed with thinset or self-leveling cement. Flex Rolls are slightly more difficult to install because they must be cut and turned to accommodate the room’s layout. Cable is the last choice, and it’s available with two installation options: fixing strips or a Prodeso Installation Membrane. Fixing strips simply adhere to the subfloor with double-sided tape and allow the cable to be spaced properly and laid out in a serpentine design from one end of the room to the other. This option is very flexible but also more labor intensive. The Prodeso Installation Membrane is a simpler option that allows the cable to be installed between rounded square-shaped reliefs, which keep it properly spaced and in a serpentine design. The membrane also has the added benefit of faster installation of tile because there is no wait time needed for the thinset to dry. As a result, the entire floor-heating system and tile installation can be completed in the same day. To see the full range of options available, visit www.warmlyyours.com. Here, you can also learn more about electric radiant heating, how it works, and why it’s gaining popularity in the residential market.